Afghan policemen inspect the site of a blast in Jalalabad city, Afghanistan, July 1, 2018. Afghan officials say a suicide bomb blast has killed at least 19 people, including at least 10 members of the country's tiny Hindu and Sikh minority, in the eastern province of Nangarhar. 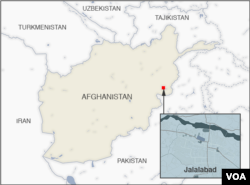 The victims were on their way to the governor’s office in the provincial capital of Jalalabad Sunday afternoon to meet with President Ashraf Ghani who was visiting the city, the regional police chief, Gen. Ghulam Sanayee, told VOA. At least 20 people were wounded in the blast. Islamic State claimed responsibility for the attack in the Afghan province where both IS and Taliban insurgents are active. The attack came hours after officials confirmed that suspected IS gunmen on Saturday night beheaded three security guards at a government-run school and partially burned the facility in Nangarhar’s Khogyani district. A provincial education department spokesman said the library and adjacent administrative portion at the Malikyar boys high school were completely burnt. No one took responsibility for the attack, though provincial officials blamed IS for being behind the violence. The terrorist group’s Afghan branch, known as Khorasan Province, regularly plots suicide bombings and beheads people it accuses of working for the government in Nangarhar, which borders Pakistan. IS claimed responsibility for two suicide bombings in the Afghan province during last month’s Muslim festival of Eid al-Fitr. The bombings killed nearly 50 people and wounded over 130 others. Afghan authorities estimate that around 2,000 IS fighters are active in the country, mainly in Nangarhar, Kunar and Nuristan in the east, and Jowzjan in the north, next to the border with Central Asian countries. Russia, however, told a U.N. Security Council meeting last week that Afghanistan-based IS has up to 10,000 fighters in its ranks and the group operates in at least nine of the country's 34 provinces. Moscow's envoy to the U.N., Vasily Nebenzya, said that Islamic State “is constantly consolidating its positions in the north of the country, turning it into a springboard for its expansion into Central Asia."